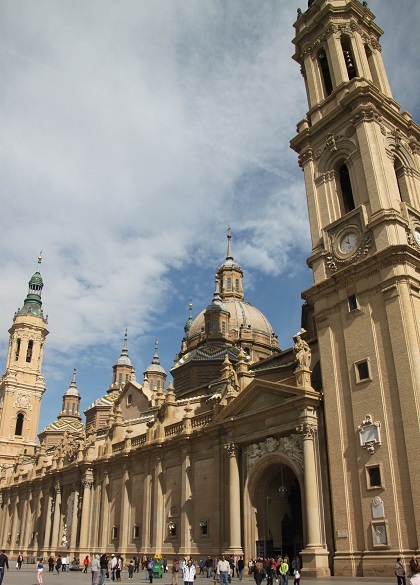 As we walked down the main shopping street in Zaragoza towards the Plaza del Pilar we caught our first glimpses of the basilica – just stunning. Son was more interested in looking in the touristy shops and choosing a souvenir – we did that, I was keen to get to the church and see it in its full glory. 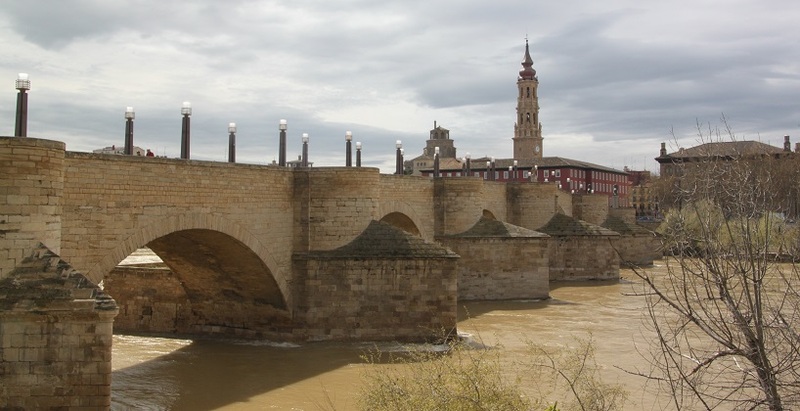 Right on the banks of the River Ebro this is – rightly – Zaragoza’s pride and its symbol. Immense is an understatement – the structure itself seems to go on forever and those 11 tile cupolas on top are breath-taking. The faithful believe the Virgin Mary appeared on top of a marble pillar in AD40. 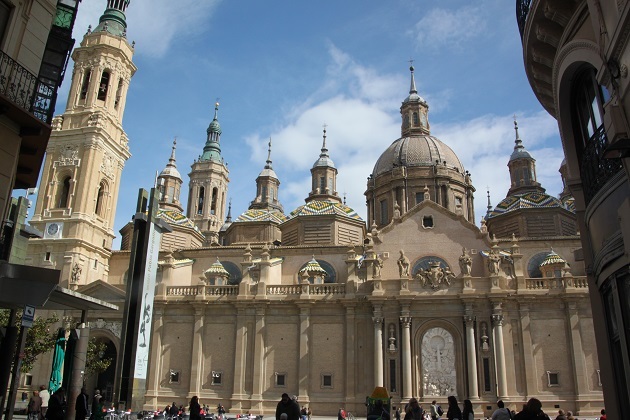 A chapel was built around the remaining pillar and was followed by a series of ever more grandiose churches culminating in this enormous basilica. 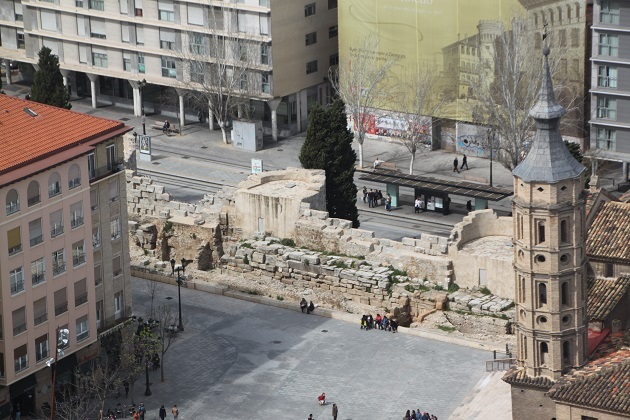 Every October the entire city celebrates the Virgin with the Fiesta del Pilar – what a spectacle that must be. Parties every day, lots of flowers, exhibitions, music concerts, it just sounds incredible. We didn’t get to experience all of this but we did go inside the church. Entrance is free, there was a service going on while we were inside but it is huge and you could explore and walk around where you pleased. I was a bit surprised to see people taking pictures, using flash and videoing the interior despite a plethora of notices requesting to refrain from this. Being an obedient sort I did as I was asked so no pictures of the inside but suffice to say it is light, bright and beautiful. There are 2 frescoes by Goya and an amazing 16th century alabaster altar piece. We also found the legendary pillar – a bit of a giveaway with a long queue of people waiting to kiss the pillar. A tiny oval shaped portion is exposed and we watched as a steady stream of people lined up to brush lips with this. Apparently even popes have air kissed here. Son was a bit too fascinated with the confessional boxes, scattered throughout and all occupied by priests with people kneeling before them making confession. He had only ever seen this before on television and was perhaps a little too interested – my job to keep him at a respectable distance was none too easy. 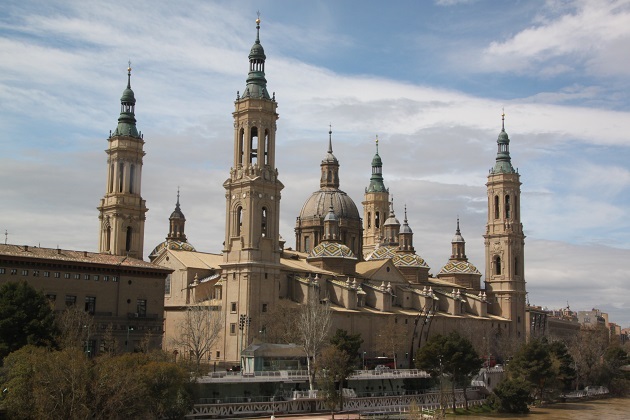 Zaragoza was held by the fascists during the Spanish Civil War and the basilica was targeted by anarchists controlling the countryside. Two shells struck the church in 1936 and failed to explode – they are still hanging from the roof and you can see the holes the bombs made in the ceiling. The faithful said it was a miracle, the cynical said it was faulty Czech munitions – take your pick. 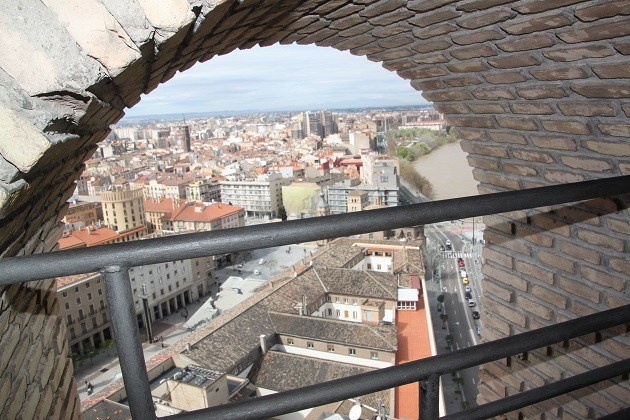 After exploring the inside we headed to the tower – wonderful and a great place to view the city. 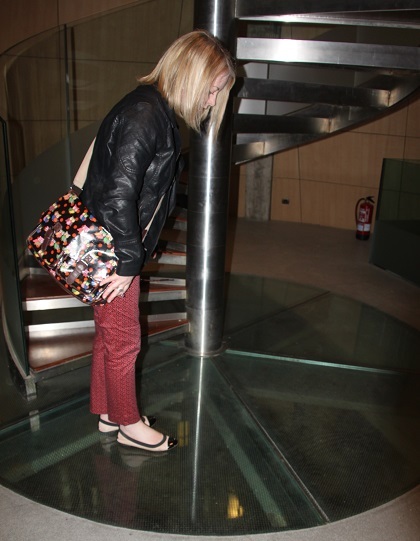 We paid the entrance charge, stepped into a swish, glass, modern lift which whisked us most of the way up. 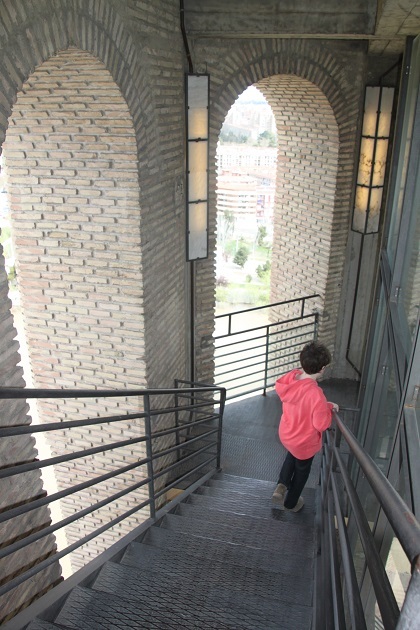 From the instant he stepped out of the lift though Son hated being at the top. I must admit, climbing the last section with the wind blowing and just a little rail between us and a very steep drop did make my stomach turn over more than a bit. I focussed on stomping up the steps. Going down was much better. 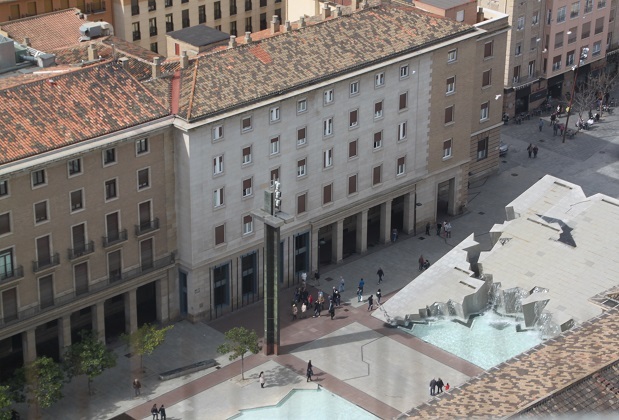 We had a bird’s eye view of the fountains in the square below and saw how perfectly they were cut out of the ground to depict the Hispanic map. We also spotted an old stone bridge spanning the river and decided to cross this afterwards to get a view of the basilica from ground level. 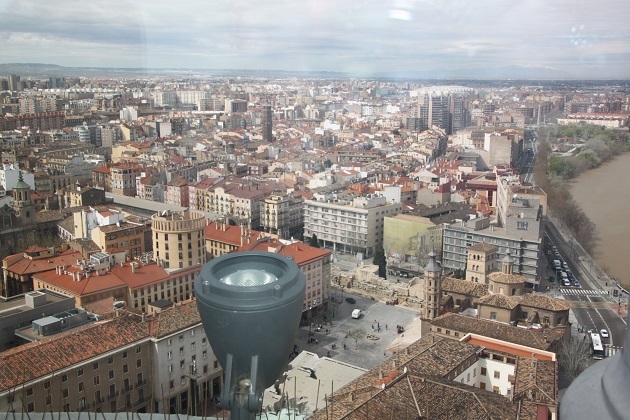 Best of all though was the view of those cupolas from above – stunning. We took the lift back down, walked to the bridge and across to the other side of the river. Great views from here too, this church is a stunner from every angle. it’s huge! love the tiles! and the view is superb! The tiles are my favourite – so colourful. 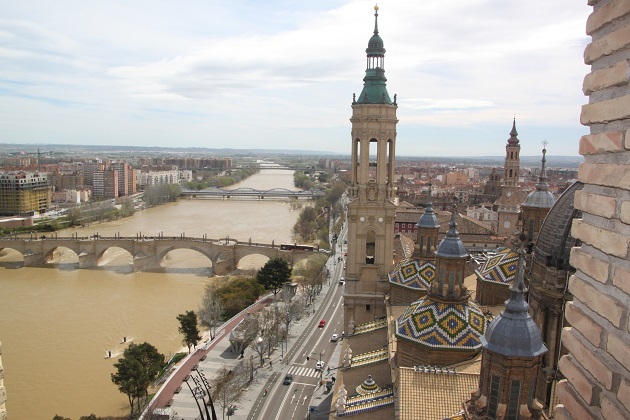 Those tiles are so beautiful as is the cathedral, like the old bridge too. I just loved this cathedral – those colourful tiles are just stunning and to see them up close from the top of the tower was wonderful. Nice capture of your experience and the beauty all around. It’s amazing how one misses so much when visiting areas until we see it in photos and pause to reflect. Joy, the cathedral sounds magnificent! I love to visit churches and cathedrals wherever we travel! But, I don’t care for heights, so stairs and a rail with a drop-off view is too much for me. The views looked stunning! This was definitely not for the faint hearted Pam – my knees did wobble a bit going up there I have to admit!! The views were amazing though and I just loved the view of the roof actually most of all. One of the most colourful cathedrals I’ve seen for sure! The building looks incredible and so does the view. I am just not sure I would be brave enough to climb that high in order to see it. I have to admit to a bit of wobbling legs climbing up those steps with just that rail – actually once we were at the top it was fine, the steps and sheer drop did it for me!! The views though are amazing and the extra bonus was the lift meant the last climb was relatively easy!! Absolutely lovely. Thank you for sharing. Haven’t been to Spain in a while. (I guess living in Mexico makes it not as exotic) hope your trip is going on well. What’s your next stop? It’s exotic for us Brian – we’re not so used to the sunshine here!! Not sure where next… still looking and planning! It’s so beautiful! You’re really making me sorry I didn’t take the time to visit this city considering how many times I’ve skirted around it! Sorry Susan!! 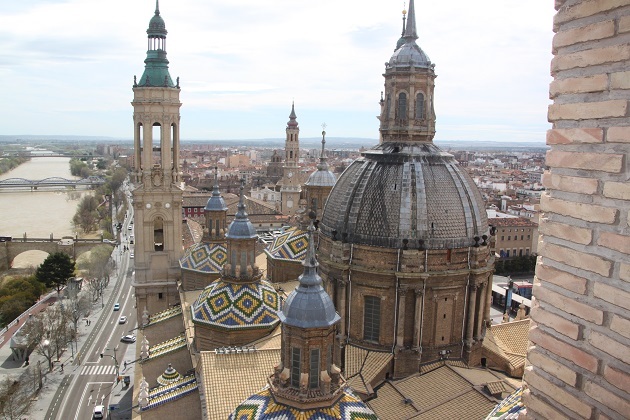 It is a beautiful church though isn’t it, those cupolas are just stunning and the chance to climb up to the roof and see them properly was a really special experience. Fascinating thanks for the tour. Love the tiles. 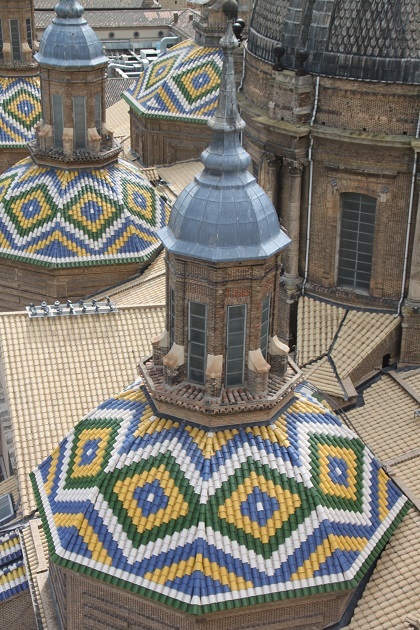 I did too – don’t they just look amazing on the roof of an already impressive church! One of the most impressive cathedrals I’ve seen for sure Coral – we loved the bridge too and the different view from there!! Always astounded at the priceless art just hanging on the walls of churches or carved into their walls. Great views too. I know, that always blows me away too!! Thank you Rosemary! I know what you mean about the ipad, I use mine when I’m away and often struggle, nowhere near as good as the computer. You must have brought the sun, we’ve been loving all this good weather and now hope it lasts for the weekend!! Hope you have a lovely weekend too. WOW! This looks like somewhere I definitely want to visit! 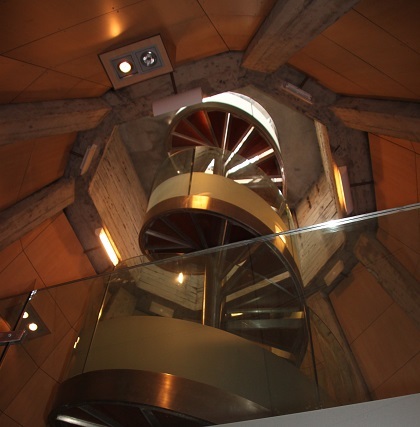 The spiral stairs are amazing. It is a beautiful church with the most wonderful views, definitely a great place to see. What a great place, great colours and architecture, I particularly like the church, very impressive. The church is incredible – I loved the roof, so vibrant and impressive. It is definitely worth a visit – a hidden gem! It’s well worth a spot on the list Shona!! 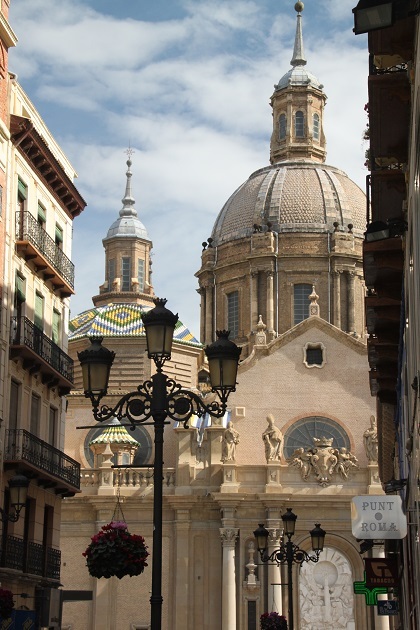 We are not really fond of churches, but the architecture of that cathedral is just amazing! 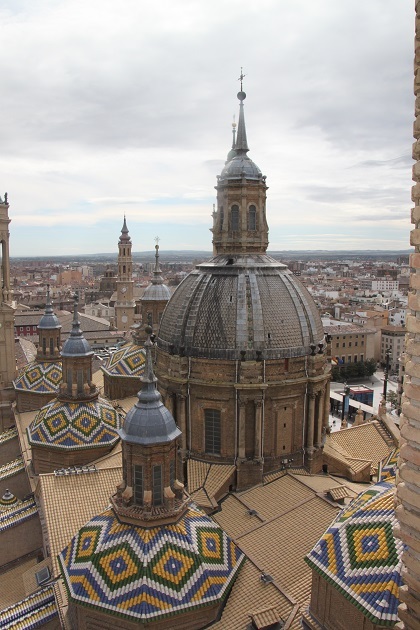 It’s stunning – my favourite are those tiled cupolas, just beautiful. Stunning aren’t they – so colourful and lovely.